There has been a major upheaval at the helm at Angus Energy plc. Paul Vonk was ousted as Managing Director at the end of January and replaced by hereditary peer Lord Lucan; and Cameron Buchanan has stepped down as interim Chair to be replaced by Lord Clanwilliam, another Eton-educated peer. Surrey County Council’s Planning Committee was due to decide on UK Oil & Gas plc (UKOG)’s application for four new oil wells plus and one water reinjection well at its meeting in April, but that now won’t happen. The next meeting is on 22 May, but it’s not certain the Planners will be able to scrutinise the application and all the objections by then. UKOG has revealed details of its proposed new drilling site in Dunsfold, near Guildford. Within days, the local community had organised a well-attended public meeting to discuss the plans, and pledged to resist them. Keith Taylor, the Green MEP, sent comments on Surrey County Council’s decision not to ask for an Environmental Impact Assessment. Please feel free to use any of these ideas in the campaign as it rolls out. Keith Taylor, the Green MEP who retires in 2019, has been a strong supporter of anti-oil-and-gas-drilling schemes across the South East. Keith has written expert submissions to planning applications and other consultations, hosted meetings and film screenings to help residents get informed about what’s happening in their area, and provided unfailing moral and intellectual support to campaigners across the region. On the eve of his retirement, Keith published two reports which will prove useful resources for campaigners and others. As an earthquake rocked the Charlwood area this morning , scientists from Edinburgh University have made a submission to Surrey County Council  which points the finger at the Horse Hill oil site for 13 quakes in Surrey in 2018. Surrey residents gathered next to the Horse Hill oil drilling site today to protest against the impacts of extending drilling for 25 years. 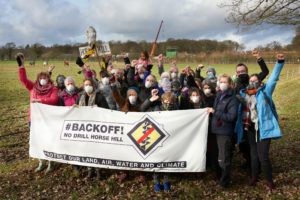 Wearing air pollution masks, they called on Surrey County Council to turn down unpopular plans by Horse Hill Developments Ltd to move into a 20-year production phase using seven wells on an expanded site. This would make Horse Hill – in rural Surrey near Hookwood – into the UK’s second largest onshore production oilfield. As the oil drillers ramp up their aspirations to turn Horse Hill in Surrey into the second largest oil production site in the UK, get some inspiration from the fight against fracking in Australia. 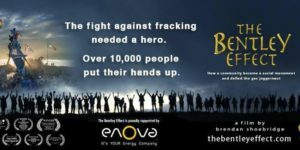 This powerful documentary tells the tale of a community that stood together – and saw off the gas industry. This screening is hosted by Keith Taylor MEP, who will take questions at a short Q&A session after the screening. Horse Hill Developments Ltd is currently testing oil flows from its two wells at Horse Hill. Now they want to add four new production wells and a well to dispose of contaminated waste water. The planning application is for 25 years. They say they could produce more than 500 tonnes of oil a day. If achieved, this would make Horse Hill the UK’s second largest onshore oil producing site and UKOG (the parent company) the third largest onshore oil company in the UK (if you believe their claims). This would fund further oil exploration across the Weald and the Isle of Wight. Please object to the plans before the deadline of February 18th (although the County Council will consider objections up to the time of the planning meeting). You can view the planning application – and object – on the Surrey County Council website. Horse Hill Developments Ltd have submitted their planning application for the drilling of five new wells (one for water reinjection) and other infrastructure to enable the production of oil from six wells for a period of 25 years. More than 200 MPs back Divest Parliament campaign – but where are the Surrey MPs? A campaign to get the Parliamentary Pension Fund to divest from fossil fuels has won support from 200 MPs – but none of the Surrey MPs has signed up yet. The list includes Conservative MPs from around the country and Surrey Greens are urging the 11 MPs in Surrey to jump on board.